My husband loves it when I make something using up the odds and ends of things in my fridge, as he never knows what he is going to get. I decided to make a chicken stir-fry as I had a couple of chicken fillets in the freezer and plenty of vegetables to finish up as well as having some dried rice noodles left over from Christmas. 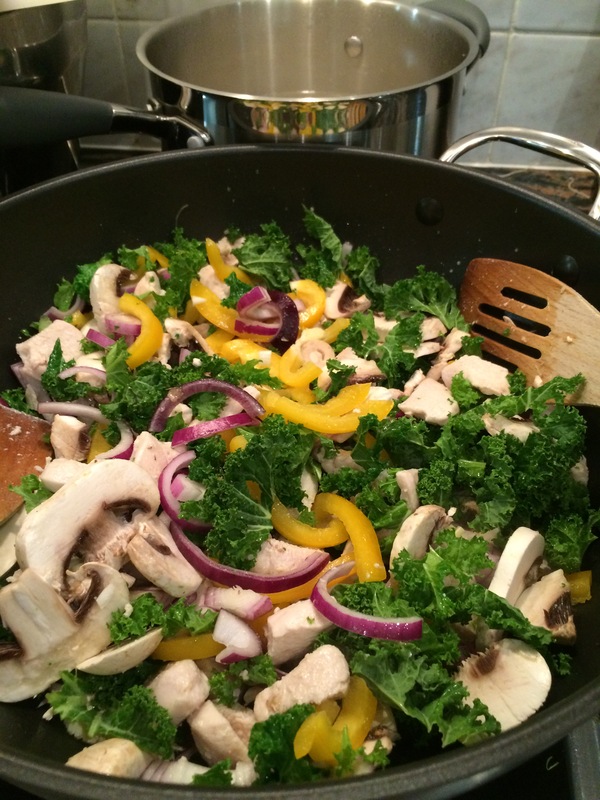 I chopped up the chicken and quickly stir-fried it in a little coconut oil until cooked then added some sliced mushrooms, a couple of red onions, half a bag of kale (thick stalks removed), and three-quarters of a yellow pepper sliced. Whilst quickly tossing the stir-fry over a high heat, I added the rice noodles to boiling water – they only take three to four minutes to cook. For the sauce, I added to the pan a good lug of sesame oil, a very good couple of shakes of tamari and a very good squirt of raw honey. A quick seasoning with sea salt and black pepper, I then added the drained rice noodles and it was ready to go. Absolutely delicious AND gluten-free which is important for my husband. I don’t buy ready-made stir-fry sauces as most contain wheat/gluten. I love a stir-fry as it takes only minutes to make and the ingredients can be varied each and every time. This entry was posted in Dinner, Lunch, Vegetables and tagged Chicken, Dinner, Gluten Free, Healthy Eating, Peppers, Stir-Fry, Supper, Vegetables, Wheat-Free. Bookmark the permalink.